(Toronto, 6 Feb 2017, updated 4 Dec 2017) About a year ago, we calculated a projected impact factor 2015 for i-JMR. We now repeated this exercise for the 2016 impact factor (which can by definition only be calculated in 2017). A = the number of times that all items published in that journal in 2014/15 were cited by indexed publications during 2015. 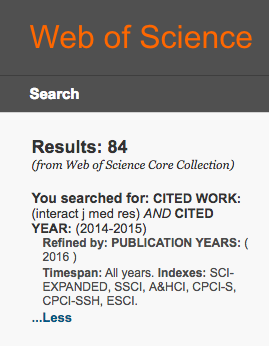 B = the total number of "citable items" published by that journal in 2014/15. We are proud to report that the projected impact factor for i-JMR (2016) is 2.27, calculated from 84 (citations in 2016) / 37 (citable published articles 2014-2015). Disclaimer: Calculations are our own and are not provided or endorsed by Clarivate Analytics, the owner of Web of Science and the Journal Citation Reports.